Choosing between gastric sleeve vs gastric bypass is a huge decision to make, as the implications will affect the future of your life. It’s important to know exactly what you are signing up for when determining which bariatric procedure is best for you. Statistics show that since 2005, gastric sleeve and gastric bypass are being out-chosen for bariatric surgery. Gastric bypass surgery used to account for 80% of all the bariatric surgeries in the United States. Gastric sleeve surgery accounts for over 90% of all bariatric surgery procedures performed today. Here we will show the pros and cons, similarities and differences, and long-term results you can expect for both gastric sleeve surgery and gastric bypass surgery. Vertical Sleeve Gastrectomy (VSG) is a permanent weight loss surgery that downsizes the stomach by as much as 85%. This restriction helps in two ways: first, the smaller stomach capacity contributes to making patients feel fuller faster – therefore reducing caloric intake. Secondly, the hunger hormones (Ghrelin) are reduced, allowing patients to be free of hunger desires. Gastric Bypass Surgery is a very powerful weight loss surgery that uses two surgical methods to achieve big weight loss for patients. Gastric Bypass uses restriction and malabsorption to reduce caloric intake considerably. Gastric bypass is intended for patients who are suffering from co-morbidities, along with very debilitating obesity. 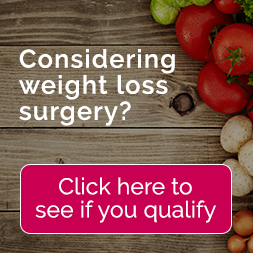 The notable difference between these two operations is that gastric bypass provides slightly more expected excess weight loss (%EWL) than the gastric sleeve – although comes with more potential risks and complications. 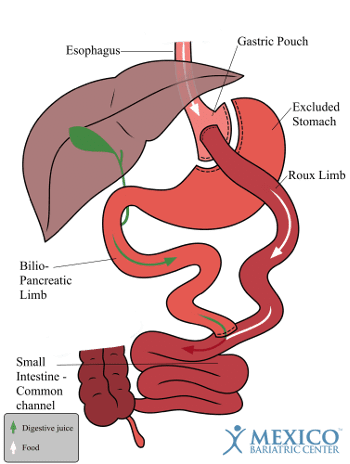 A Rand Corporation study found that patients lose on average 20 pounds more with Roux-en-Y gastric bypass than with vertical sleeve gastrectomy. Gastric sleeve surgery is less invasive than gastric bypass and there is no rerouting of the intestine. After gastric bypass, there is fat malabsorption which does not occur in sleeve surgery (VSG). As a result of bypass malabsorption, essential nutrients and minerals are not absorbed by the body. Therefore, it is important to take vitamins and dietary supplements lifelong. There is a chance to stretch the new stomach (stoma) in gastric bypass and not so much in gastric sleeve as the pyloric valve stays intact. Gastric sleeve is good for patients with extensive scars from a previous surgery in the abdominal area. Sleeve is also suitable for patients with ulcer history, taking aspirin, or smoke. RNY gastric bypass is better for patients with severe acid reflux and GERD. Patients with slow metabolism are better off with gastric bypass. 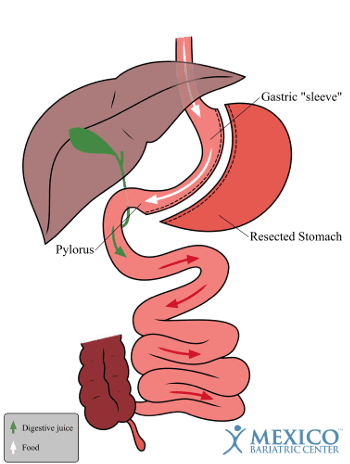 Also, if patients have previously had gastric fundoplication surgery, meaning the stomach is wrapped around the esophagus valve to control acid reflux, then gastric bypass is the best option for them. Newer surgery with limited long-term data. 60%-70% of excess weight 2 years. Having insurance cover for weight loss surgery is a difficult process in the United States. You should first make sure your doctor agrees with your decision to get bariatric surgery. Then, speak with your insurance provider to see if you have coverage for gastric sleeve surgery or gastric bypass surgery. If you have insurance coverage, it generally takes about one year to be approved – after a long pre-op diet, check-ups, classes, psychologist, and nutritionist meeting. Mexico Bariartic Center can help you decide which surgery is best for you quick and hassle-free. Gastric sleeve surgery has the lowest potential complications compared to other weight loss surgery procedure. Mainly, because it only removes a portion of the stomach. There is slightly less excess weight loss than gastric bypass. The complications include; sleeve leakage, hemorrhaging or bleeding, and stroke or heart problems. Gastric bypass is one of the more established bariatric procedures. Although most surgeons have extensive experience with bypass surgery, there are still more complications than gastric sleeve surgery. The complications include gallstones, stomal stenosis, pouch stretching, leakage, nutrition/protein deficiencies, dumping syndrome, vomiting, and ulcers. 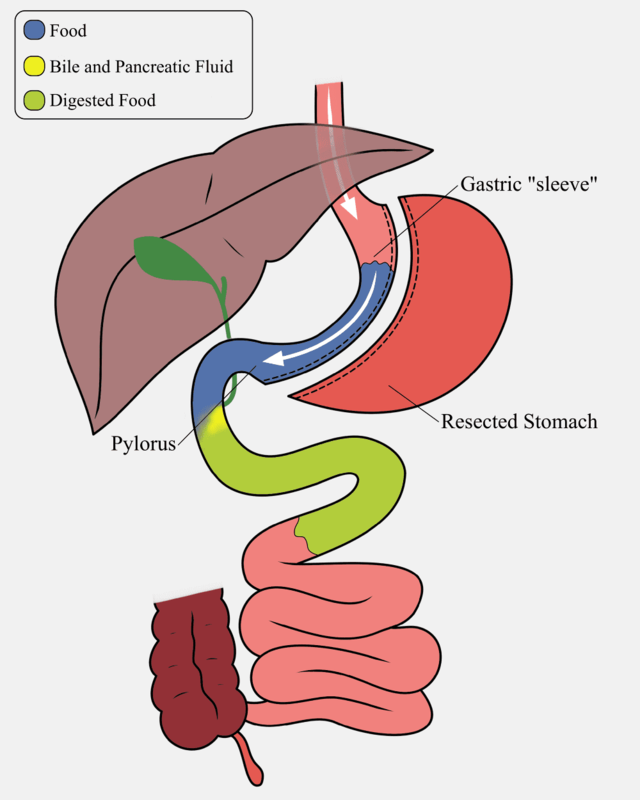 New stomach is like a hot dog or a “sleeve” and has the same shape as the duodenal switch pouch but smaller. With vertical sleeve gastrectomy surgery, there is no anatomical changes, no changes to pyloric valve, and no intestinal bypass. The gastric sleeve surgery significantly restricts the volume of food that can be eaten. The mixing of food with bile and pancreatic enzymes occurs as before surgery with no changes. Therefore, there is a no malabsorption of nutrients, dumping, or bowel movements. 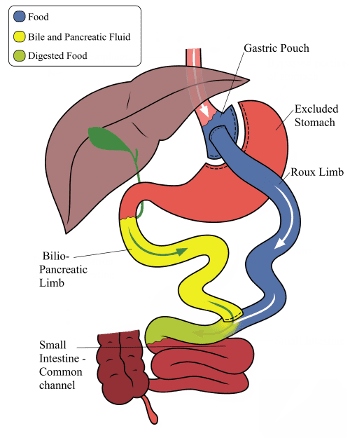 New stomach is a small pouch and is connected to the small intestine where food and digestive juices are separated for the first 3 to 5 feet. The RNY significantly restricts the volume of food that can be eaten. The delay in mixing of food with bile and pancreatic enzymes induces a moderate fat and protein malabsorption as well as calcium, iron, and B-complex vitamins absorption reduction. The alterations in intestine also change the bowel movements: different smells, more gas, and occasional cramping. Gallstones and Bariatric Surgery: To Treat or Not to Treat?